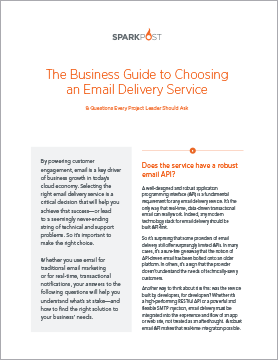 Selecting the right email delivery service is a critical decision that will help you build success with your app or service—or lead to a seemingly never-ending string of technical and support problems. So it’s important to make the right choice. Whether you’re developing requirements or evaluating options, this practical guide will help you ensure a good fit for your needs. Download it today to get started on the right path.